Alex McLeish says he will need to “stand up and be brave” as the pressure increases on the Scotland manager. Sunday’s 3-1 home loss to Portugal means he has won two of his six games in charge of the national side. The friendly defeat came just three days after a 2-1 collapse away to Israel, ranked 94th in the world, in the Nations League. “It’s never easy to lose and that was a tough weekend,” said McLeish. “I have to stand up and be brave and take it forward. 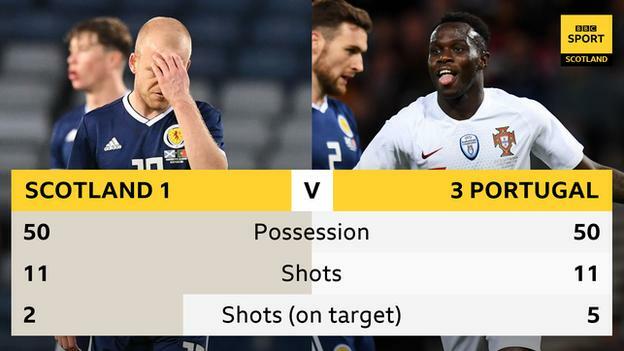 Scotland paid the price for poor defending as Helder Costa, Eder and Bruma all scored for Portugal at Hampden. The game ended with a consolation goal as Steven Naismith finished off a sweeping move involving Graeme Shinnie and Gary Mackay-Steven. McLeish felt his side played well, with the performance an improvement on Thursday’s defeat in Haifi. They face Israel again next month as well as a trip to Albania to complete their Nations League section. “It’s basic errors that we made and that is the disappointing aspect of it,” said McLeish. “You expect the top teams to cut you open with majestic skills, but we were the perpetrators of our own mistakes. “I thought there was a lot of good football. We had a good game plan, we were compact, we pressed when we had a chance to press. I know there was a few Portugal players rested but there was a still a hell of a lot of money out on that pitch. 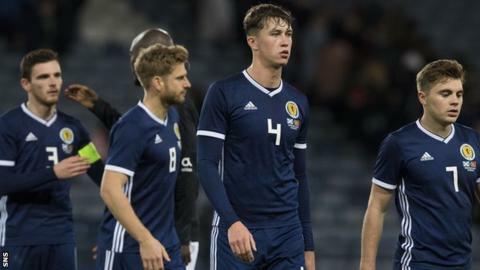 Scotland had a number of players missing, with Kieran Tierney, Scott McTominay, Robert Snodgrass, John Souttar, Charlie Mulgrew all dropping out. McLeish also insists he has no issues with Leigh Griffiths deciding to stay at Celtic to work on his fitness. “I admire him for that,” said McLeish. “He wants to get to a level of fitness where he can blow Brendan [Rodgers, Celtic manager] away, and blow the nation away and hopefully he can score the goals and get himself where he wants to be in terms of fitness and be a contender again.